October | 2013 | Not Your Average Hockey Blog. 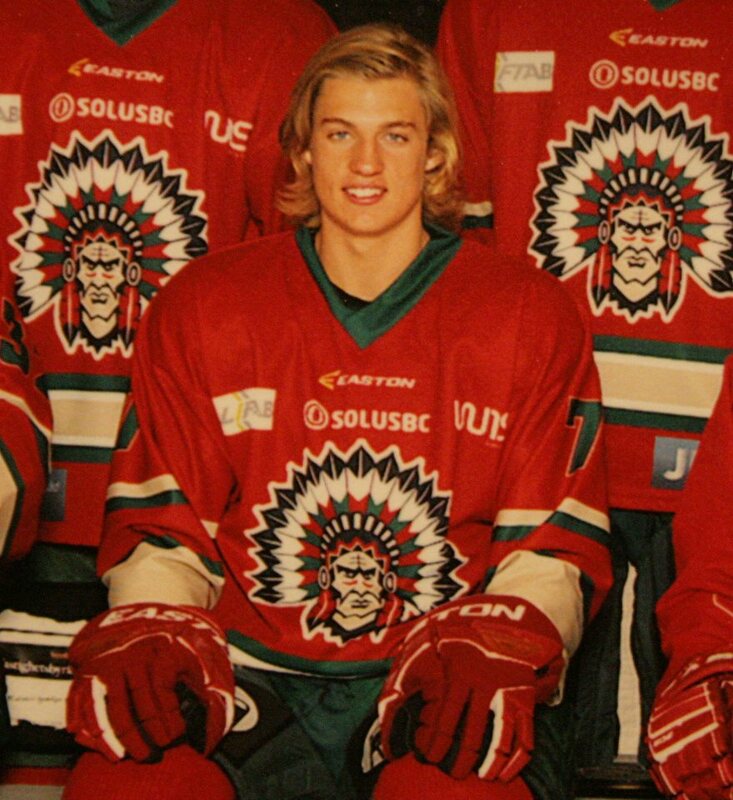 We recently caught up with Frolunda Defenseman William Lagesson! Does that name sound familiar? Well it should! If you remember well, another Frolunda player we interviewed; Anton Karlsson suggested we interview him! If you don’t remember it, maybe you should check out the interview again! Here’s the link: https://notyouraveragehockeyblog.com/2013/10/18/interview-with-anton-karlsson/. So a little about William! He’s a defenseman who plays for Frolunda, and just like Anton, this is his draft year. More of a stay at home defenseman, he isn’t afraid to join the rush. If you want proof, in 2013-2014 while playing in Frolunda J18 Allsvenskan, he scored 6 points in 12 games! For a forward, that might not be much, but for a defenseman? That’s a lot! He’s also had plenty of international experience, playing for Sweden in the U16, U17, and U18! If you like our interview with William, let us know! Share with your friends, like us on Facebook here: https://www.facebook.com/notyouraveragehockeyblog or you can follow me on Twitter: @HkyBlogger! Without further to do, here is our interview with William Lagesson! My day has been good. Do you follow a special game day schedule or superstition? On a game day I wake up and eat a good and healthy breakfast. After that I often take a walk with my dog. Then I play some xbox. After that I take a powernap and eat again and then go to the rink. What kind of defenseman do you consider yourself? 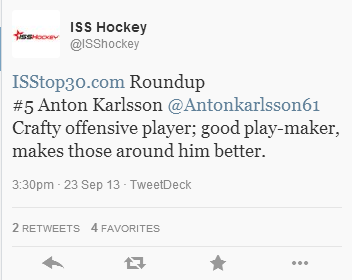 Offensive like Erik Karlsson? Defensive like Shea Weber? Two Way like Alex Edler? I’d describe myself as a defenseman, but I can also join the offense sometimes. So in the middle of a defensive defenseman and a two way player. This is your draft year. Will you try to join the NHL Draft this year? Of course I will try to get in the draft this season; it’s hard but I will try! I don’t really know, maybe because there’s so many good players and probably I have met the new Forsberg. Do you get recognized on the street often? No that doesn’t happen too often. It happened once but it was right after we won in Canada. So you’ve played for Sweden a few times. Whats the coolest team to play against? It was very fun to play against Canada in the Ivan Hlinka Memorial Tournament. What is your best attribute as a hockey player? To defend the important defensive zones on the ice. Something you need to work on? Quicker feet, and my shot. When we won in Canada last year, it was very cool. I don’t know the lowlight. So the next part is more of a get to know you part! Weirdest thing you’ve seen on the ice? When a guy on my team kicked one player in the other team. Your roomate on the road? It has been difficult and frustrating to be a Flyers fan lately. Not just this season but since June 23, 2011 as far as I am concerned. The day the organization traded Mike Richards. The Flyers decided they needed a ‘star goalie’ following that debacle against Boston earlier in the spring. I remember seeing Snider’s face after the sweep and it was obvious changes were in the picture. What’s done is done and Bryzgalov is gone. It was and will remain the worst acquisition ever made by the Flyers. It also goes to show a contract does not mean much in Philly. Not with Paul Holmgrem around anyway. Carter, Richards, Brière and Bryzgalov were all given long term contracts and yet the team roster keeps changing year after year. This is not the way to win a championship. Except for the New York Yankees and some soccer teams in Europe I don’t recall any professional team that bought a championship. 1) The fans and the management (hopefully) are finally starting to realize that seeking out to sign every single player available on the market may not be the way to go. 2) Giving more time and opportunities to drafted players and other young players acquired via trades to develop within the organization. 3) Let things go and be patient. Stick with the same roster and adjust with minor trades when and if need be. Be active but be wise. Sometimes the best trades are the ones you don’t make. Now the question: Is this change of mentality possible with Paul Holmgrem around as GM? I don’t think so. For the owner Ed Snider well I would hope he learned yet another lesson at his age. Those buyouts are costly and he doesn’t like being the target of a bad press. I like the man and I don’t want him gone. Even by natural cause. One thing is for sure he tends to be docile with former players turned coaches or managers. However he will have to replace Holmgrem soon. I’m not sure if there is a special advisor with the team. If there is none there should be one to make sense when the team is in a mess. Every team should have one. Serge Savard was around for the Molson family two summers ago when a desperate Montreal Canadiens team was looking for a GM. Scotty Bowman gave the Blackhawks some kind of direction as team advisor before the two Cups ended up in the Windy City. Detroit has one. L.A. too probably. Decisions need to be taken at another level. Holmgrem does not have to be fired. He can be given another position within the organization. Ron Hextall is back in Philadelphia as assistant GM with a Stanley Cup ring from L.A. and I believe he is next in line to be the general manager of the team. It would only be logical. For a GM, signing, trading and being constantly on the phone with other teams do not serve any purpose unless you have a vision of where the team is going and this is where Holmgrem deeply failed. Laviolette should have been fired after the loss against the Devils in the 2012 playoffs. The short season last year was a disaster for the coach, the team and we witnessed the end of the short Bryz era. Thank you for that. Laviolette most likely asked for a last chance he already had and it did not work in September nor October. That training camp was a waste of time all considered. I think the real 2013-2014 Philadelphia Flyers will show up by December. Lecavalier, Streit and Mason are good additions. Giroux should get in gear as well. Lines have been changed often and there is a new coach. Honestly I don’t expect Craig Berube to be head coach for a long time either. That was too easy of a choice that supports the lack of vision theory. It is tough to become head coach after you have been assistant. It comes to who makes the decisions at the end. And now those who make decisions for the Flyers are not the right people. The Flyers are not just another team. No one is indifferent to them around the league. This is a winning franchise and their fans expect them to make the playoffs every single year. I have been a fan of the Orange & Black jersey for more than 3 decades. They were down more than once but never out. They will be back. Without further to do, here is our interview with Anton Karlsson! My day has been really good so far. What is game day like? Do you follow a special schedule or anything? Morning practice, rest and prepare for game. No I don’t, maybe sleep an hour before game time. What kind of player do you consider yourself? I am a player who loves to take the puck to the net and make the other team to lose their focus on the game. I use my shot a lot to find the net, and I am also a playmaker. Yes of course I am excited for this season; this season will be great I think! Is there extra pressure knowing this is your draft year? No I don’t feel that is pressure because I will play my game and then the scouts will see if they want me or not. You are listed at both LW and RW. Is there one you prefer to play? I can play both of them but if you want me to choose I go RW! What is the best part about playing for Frolunda? All the buddies on my team, we have lots of fun and everyone always takes the game like its war! 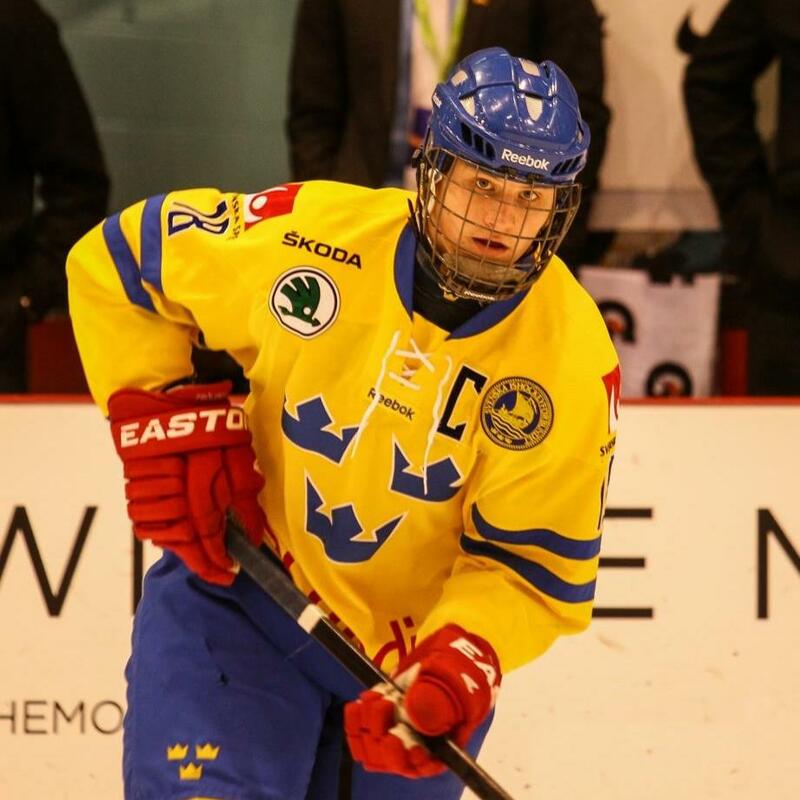 You captained Sweden many times internationally in two U17 tournaments and the 2013-2014 U18 Tournaments. Are you nervous every time putting on the C, or are you used to it? No I am not; it is something that makes you stronger so I’m used to have the C on my jersey! The next part is more personal questions. There are no wrong answers! Would you rather have a Stanley Cup ring or an Olympic Gold Medal? It is a difficult question, but I choose the Stanley Cup ring! What was your favourite team growing up? It was the Toronto Maple Leafs because Mats Sundin played there. How about your favourite player? Who’s a better player? You or Erik? I can’t answer on that question. Many types of different music. 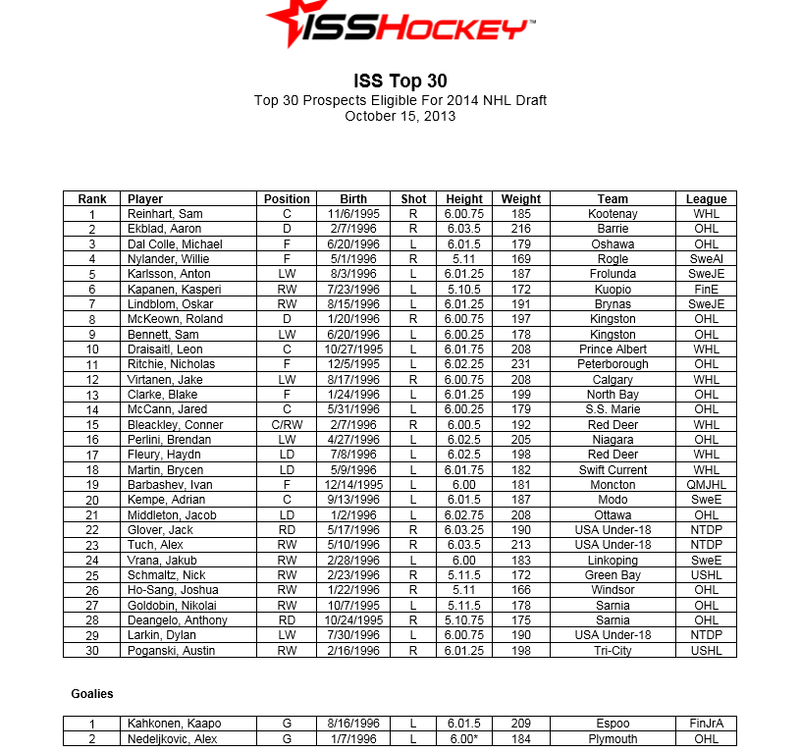 Shouout to our friends over at ISS Hockey for providing us with this month’s ISS Top 30! Check them out at https://www.isshockey.com! Do you agree with ISS? Disagree? Let us know! Comment below! So if you’ve been following the Top 5 Under 25, you really shouldn’t be surprised at this pick for number one. It’s Tampa Bay phenom Steven Stamkos! Since being drafted 1st Overall in the 2008 NHL Draft, he has been nothing short of a superstar. In my honest opinion I think he is the second best player in the league, right behind Sidney Crosby. Since he’s been in the NHL he has won two Maurice Richards, been a NHL 2nd Team All Star, 2x NHL All Star, played in the 2008 WJHC, 2009 World Ice Hockey Challenge, and 2013 World Championship. Oh yeah did I mention he’s only 23? So, that’s how it is, Steven Stamkos is our number #1 player under 25 years old! Do you agree with us? Let us know! Comment below! Who’s voting do you agree with? Let us know! Comment below! In between the Top 5 Under 25, we have something different for you guys! Do you watch the Amazing Race? Do you know of the Amazing Race? Well if you don’t follow it here’s a little introduction, it’s a show where two people form a team race around the world completing races. So our interviewee played hockey for many years, and in the 22nd Season of the Amazing Race, entered an won! Here’s our interview with former, Hurricane, Leaf, and Capital, and a few more teams Bates Battaglia! He was drafted 132nd in 1994 by Anaheim Ducks, and before he turned pro, was traded to the Hartford Whalers. He was also part of the famed “BBC” line (Brind’amour, Battaglia, Cole)! Back when you were playing in the NHL, what would game day be like? Take us through an average day. Well average day is pretty low key. Morning skate with the team, pregame meal at about 12:30. The usual chicken and pasta, then a hard shut down. Good three hour nap and then head to the arena to be there at 5PM for a 7PM game. Then it’s go time! Now that you look back at your career, what kind of player would you consider yourself? I would consider myself a power forward and 2 way player. Wasn’t a natural goal scorer but put the puck in the net here and there and was never a liability on defense. Was there one place you just loved playing? As far as city loved playing in? I loved road trips. I liked hitting all the NHL cities but I guess I like Chicago since that’s where I grew up and still have lots of family and friends there. Was there one city you just loved playing for? I loved playing for Carolina which is why I still live here today. Great fans and great organization. Playing for the Toronto Maple Leafs, is it hard to ignore the media pressure? The media in Toronto is definitely different than a lot of other places in the NHL. But it comes with the territory and you get used to it, and the media is always a lot easier to deal with if you are winning haha! People often say that chemistry is often very important in determining the success of a team or a line. Do you agree with that or disagree? Why? Definitely agree with chemistry being a big part of a lines success. Definitely helps when you have a good combination of skill, work ethic and knowledge of the game. Who has been the classiest play you’ve ever played for, and against? As far as classiest player that is pretty tough to narrow down that. I have played with so many. From Ron Francis and Rod Brind’amour in Carolina to Joe Sakic and Mats Sundin later in my career. I think hockey is definitely different in that way since most hockey players are class acts and you don’t find that in all sports. After many seasons in North America, you joined Jokerit in 2009-2010, what was the biggest difference between playing in Europe and North America? The biggest difference in hockey between Europe and here is the size of the ice and the physicality of players which incidentally play off each other. What was your highlight of your career? My highlight and lowlight of my career are pretty much the same. I never had as much fun as I did when I played in the Stanley Cup Finals. But on the latter side, it was the pretty heart breaking to lose in the finals. Tell us your experience at the Amazing Race. What was it like, and was it tougher than playing in the NHL? The Amazing Race was just that “amazing”. It was definitely tougher than I had expected. You experience so many things you thought you would never experience and countries you never thought you’d be in. Playing in the NHL is definitely tougher in so many ways which is why we probably did so well. The physical aspect of the race was easier for us than the others but it’s not all physical, its mental and interactive as well. Your grandfather was Sam Battaglia (Wikipedia) a high level member of the Chicago mob. I know he died before you were born, but were you ever told any cool stories about him? Yes my papa was involved with some organized crime in Chicago and yes I’ve heard lots of stories over the years, but those are saved for family sorry haha. Tell us about Lucky B’s? Lucky B’s is my bar I opened in Raleigh,NC in 2005, we have been open for 8 years now and still kicking. We are somewhat of a sports bar but get to be a party place later in the night and weekends. Lots of the Carolina Hurricanes as well as visiting teams visit the bar. We have skeeball, pool, corn and beer pong to name a few activities to enjoy while throwing back a few beers watching your favorite hockey game. At number two, we have another tie. This time we have a captain and a future captain! We have the current captain of the New York Islanders, John Tavares, and we have the phenom from the Ottawa Senators, Erik Karlsson! John Tavares was drafted first overall in the 2009 by the New York Islanders. Erik Karlsson was drafted 15th Overall by the Ottawa Senators in the 2008 Draft by the Ottawa Senators. John Tavares has blossomed into one of the best playmakers the league has. If you don’t know what they’re like, here’s some short clips showing their highlights! I personally had Tavares above Karlsson, and here’s why. Karlsson will be the one of the best, or the best defenseman for many years to come, but I don’t think he will be a contender for the best player in the league. I think John Tavares will be in contention to be the best in the league in a year or two. Put it this way. Many of us play fantasy hockey right? If you had the choice between John Tavares or Erik Karlsson as your first overall pick, I’d pick John Tavares. I’m not saying Erik Karlsson is a bad player, I just think he makes a bigger impact. How good is Karlsson? I could write you a gigantic paragraph, but this TSN feature explains it better than I do.